More than 50 participants from 30 countries filled to capacity the Small Hall of the World Conference Centre in Bonn to listen to, and engage with, a panel of experts on the theme of Heritage for Skills. The session included the director of the International Council on Monuments and Sites (ICOMOS) as well as the Executive Director of the World Heritage Institute of Training and Research for the Asia and Pacific Region (WHITRAP). 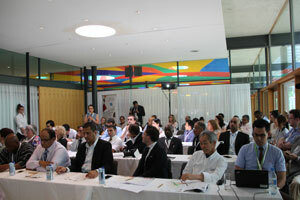 Representatives from six UNEVOC Centres located in each of the five UNESCO regions were also in attendance. For more background information, speaker biographies and electronic copies of the presentations made, please visit our page here. The panel, which was organized by UNESCO-UNEVOC, brought together 5 speakers who addressed three major themes. 1. Policy and Advocacy to develop new vocational training programmes, and strengthen existing ones, that correspond to the skills-needs of the heritage sector. 2. Institutional Capacity Building in order to allow for more North-South-South and South-South cooperation in the provision of heritage skills education. 3. Knowledge Sharing during which the panelists shared promising practices from different parts of the world related to skills for heritage. 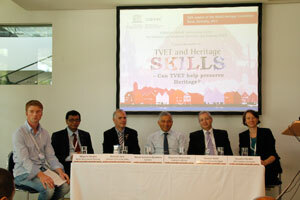 First, a clear message emerged that TVET is crucial for the heritage sector. The huge shortage of craft skills is visible in many developing countries just as demand for such skills increases. Second, there was consensus that developing skills for the Heritage sector is not just a social or cultural issue. Rather, skills for Heritage are just as much a cultural and social issue as they are an economic, employment, entrepreneurial and sustainable development issue. Third, an innovative model that combines non-formal and informal approaches is the best way to fast-track and optimize skills development for heritage, an approach that is in line with the post-2015 sustainable development agenda. Moreover, the necessity of fusion between science and technology on the one hand and creative traditional skills on the other—modernity with tradition—was underscored as essential to efforts to preserve heritage in today’s world. The recent earthquake in Nepal was raised several times as an example demonstrating the need to bring modern methods to the work of preserving heritage sites. Fourth, examples highlighting north-south-south cooperation and collaboration were given. Most notably, the joint collaboration between Helwan University in Egypt and BTU Cottbus-Senftenberg in Germany to offer a Master in Heritage Conservation and Site Management was highlighted.